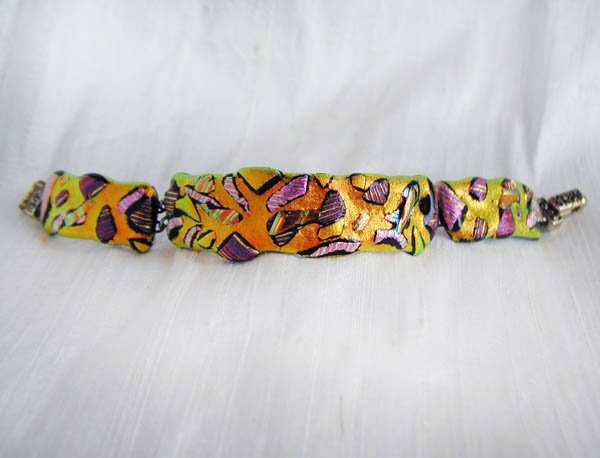 This bracelet measures 8 1/4 inches long, and is 3/4 inch wide. 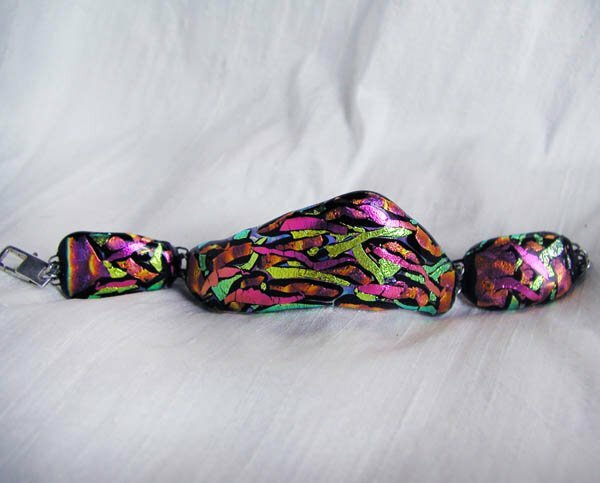 It is a stunning textural mixture of purples, green, gold , magenta, all in gleaming iridescent dichroic glass. The clasp is a raw brass fold over steampunk, very easy to use. There is also a sterling silver safety chain, shown in picture. 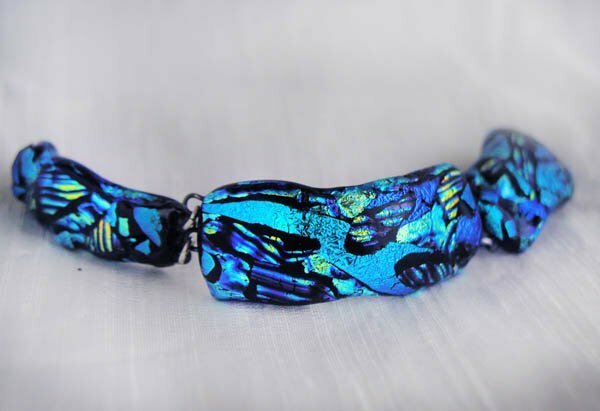 This gorgeous mixture of blues feels fantastic on you arm. 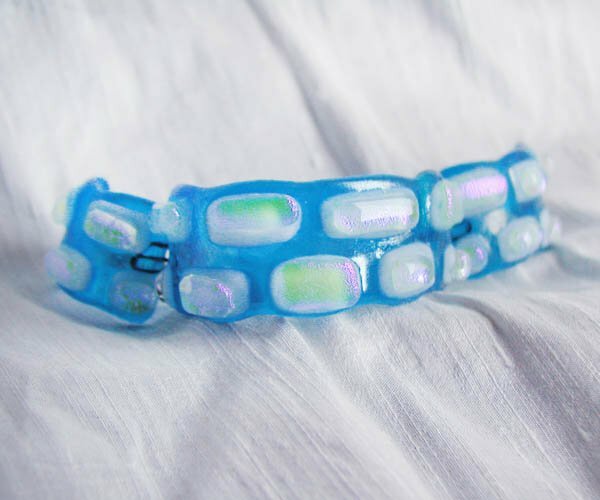 It measures 7 1/2 inches in length, with a widest point of 1 inch. The clasp is a sterling silver lobster clasp. 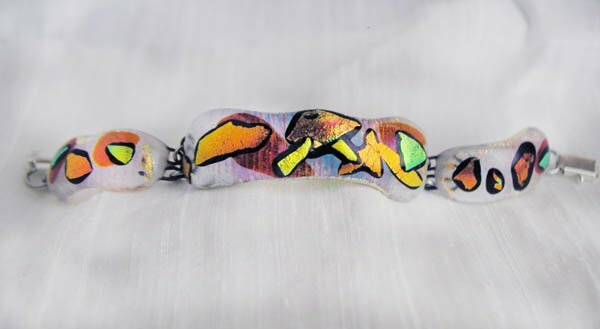 This incredible orange golden green iridescent color changing bracelet measures 6 7/8 inches long, and is 3/4 inch wide. 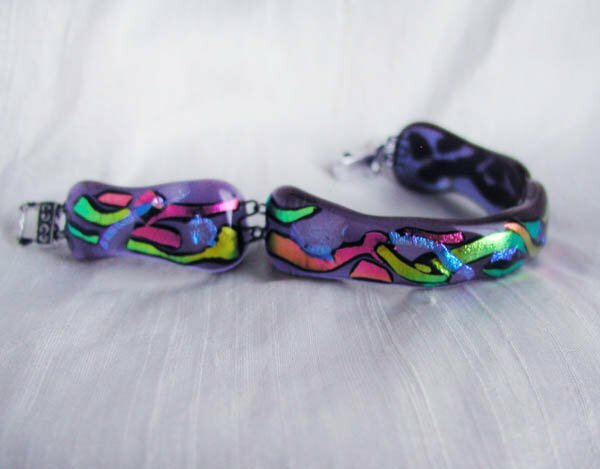 There are smooth,rounded shapes of opalescent clear dichroic glass that look like rain drops fused to the surface.all in gleaming iridescent dichroic glass. 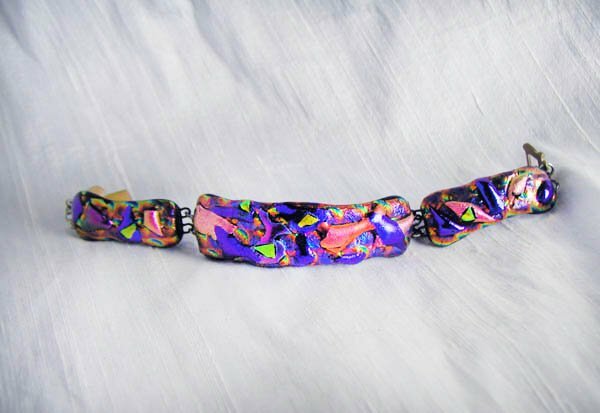 This is a very dimensional bracelet! The clasp is a very secure stainless steel lobster. 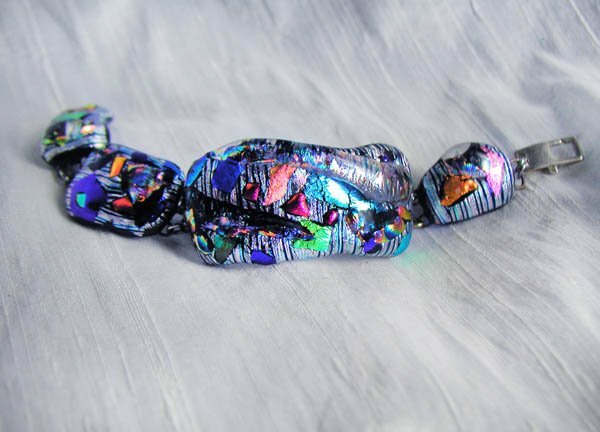 This super fabulous cuff is made of a silvery striped iridescent dichroic glass, embedded with chunks of other colors of iridescent glass, then layered with a clear rainbow opalescent textural layer. The pictures really show its glory. It is 7 1/4 inches long, 1 1/4 inches wide. A square sterling silver lobster clasp secures it. 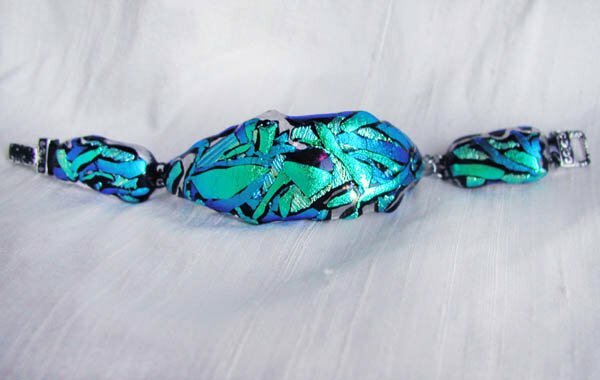 This cuff is mostly a mixture of blues and greens, reminiscent of the sea. There is a bit of deep wine here and there. It measures 7 1/2 inches in length, with a widest point of 1 1/8 inch. The clasp is a silver plated fold over magnetic closure, very easy to use. There is also a sterling silver safety chain, not shown in picture. 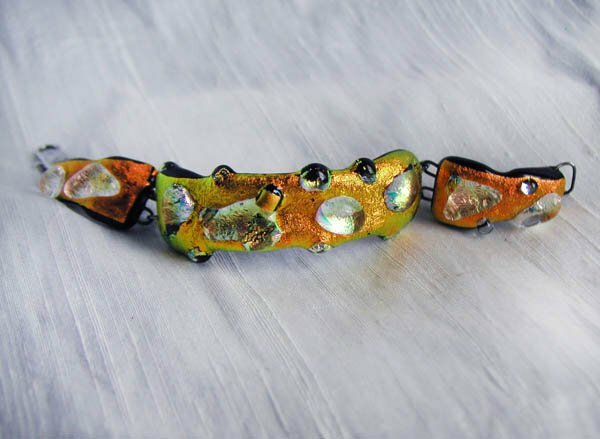 Stunning gold /orange iridescent dichroic glass makes this bracelet a real eye catcher. The sheen looks like fine textured silk. 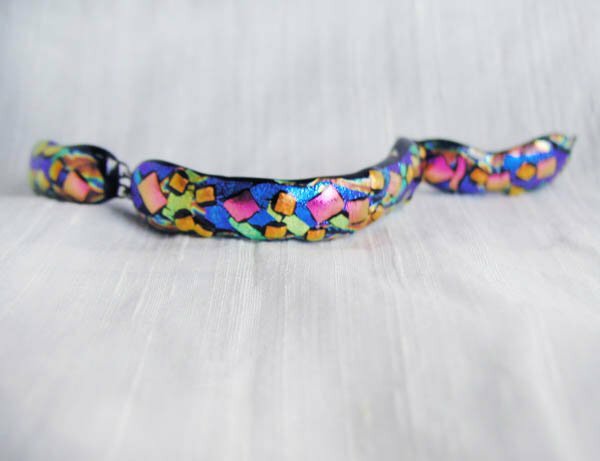 There are chunks of striped pink/magenta dichroic glass, plus gold and some green. The bracelet measure 7 3/4 inches long, and 7/8 inches wide, and is secured with a gold plated magnetic fold over clasp, plus a sterling safety chain, not pictured. 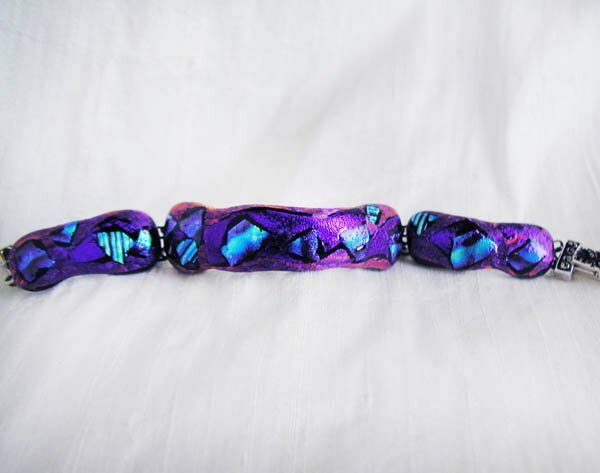 Rich purples, blues and magenta dichroic fused glass melt together to create this deco inspired bracelet. The rich colors gleam and shine out of a black background. 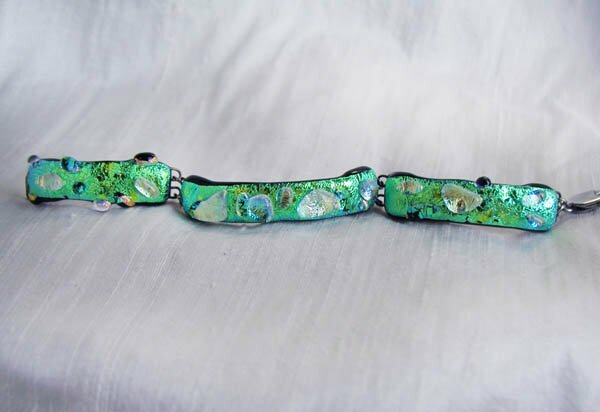 This gorgeous bracelet is 8 1/4 inches long, 5/8 in wide, and is secured using a sterling silver lobster clasp. 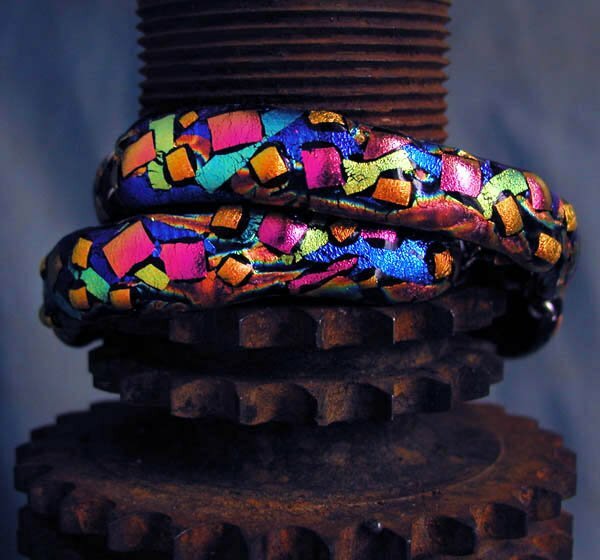 This delicious pair of bracelets shine in jewel colors. They are sold as a matched pair. 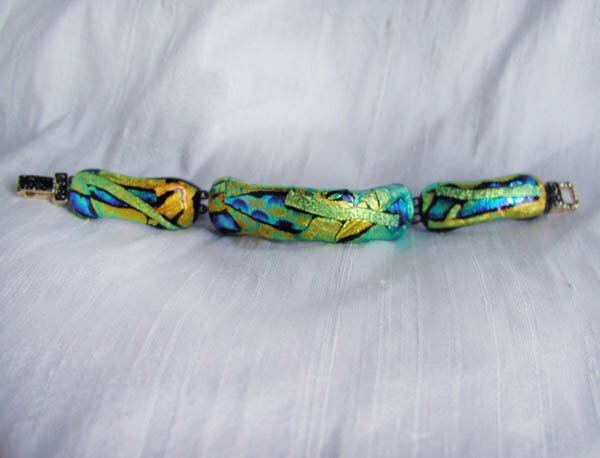 One bracelet is 8 inches long, the other is 8 1/2 inches long, and they are both 1/2 inch wide. The are each secured with a sterling silver lobster clasp. 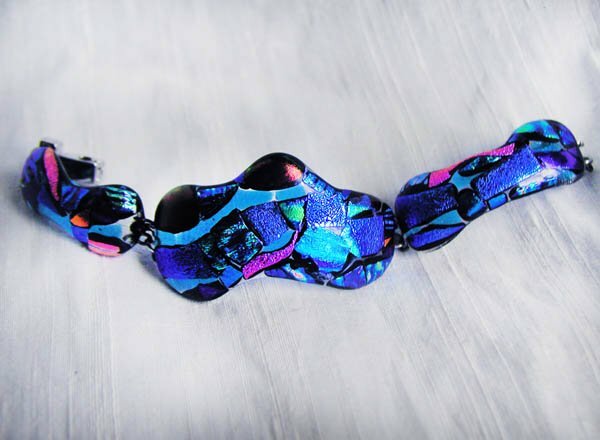 Warm, luscious blues with embedded peachy pinks, this is a beautiful bracelet. It measures 8 inches long, and 3/4 inch wide. 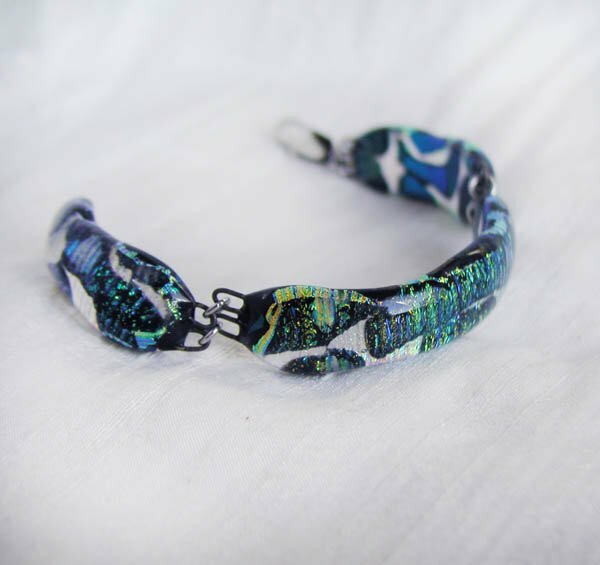 The bracelet is secured with a stainless steel lobster clasp. 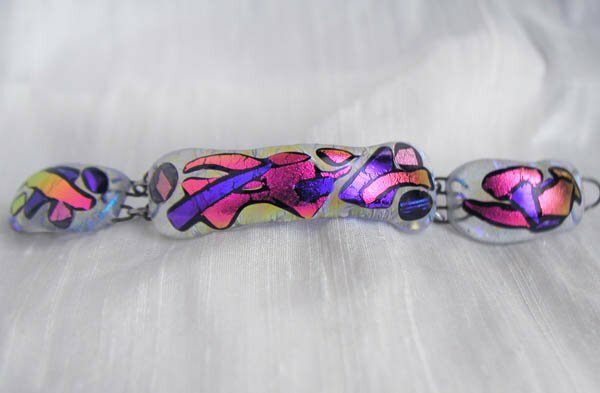 This very cool bracelet is fused into iridescent dichroic glass that is somewhat transparent, with the shiny part on the inside. The outside has swirls of golden taupe, pale green, pale lavender, and a bit of peach. There is a party going on inside, which you can see in the clear areas. The bracelet is 7 inches long, 5/8 inches wide, and secured with a raw brass fold over clasp, with a sterling silver safety chain, as shown. 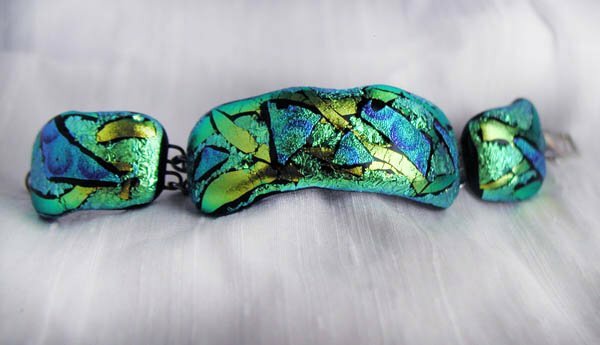 This bracelet features dichroic iridescent glass in the shades of green, blue, aqua and a shimmering subtle golden orange. There is a very Arts and Crafts feel to it. 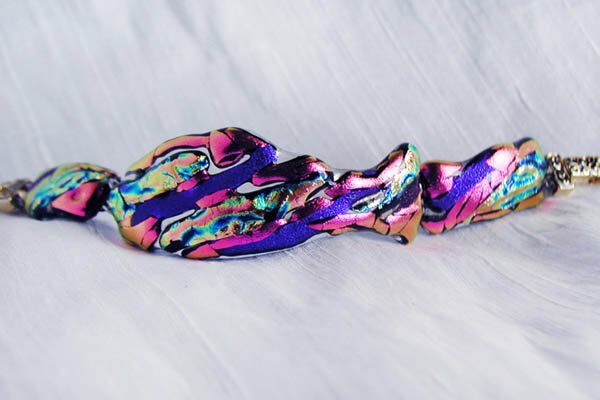 The bracelet is 8 1/4 inches long, and 5/8 inch wide. It is secured with a gold plated magnetic fold over clasp, and has a sterling silver safety chain, not shown. 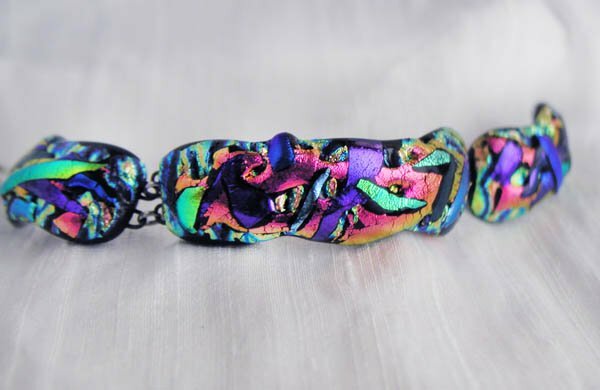 This asymmetrical colorful bracelet is filled with iridescent dichroic glass streamers of magenta, green, and gold, the colors all changing as you move. 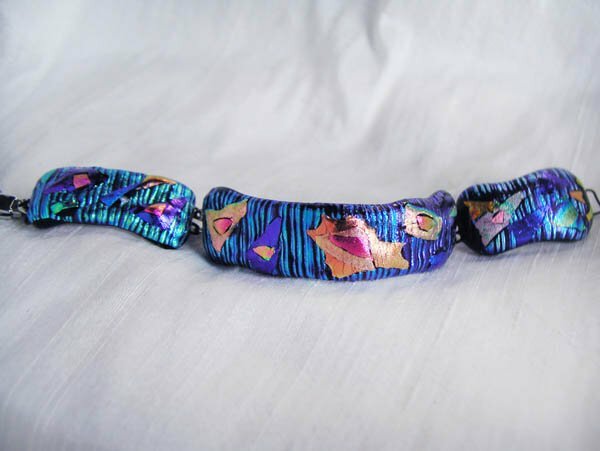 It is 7 3/4 inches long and 1 1/4 wide, and it is secured with a square sterling silver lobster clasp, as shown. 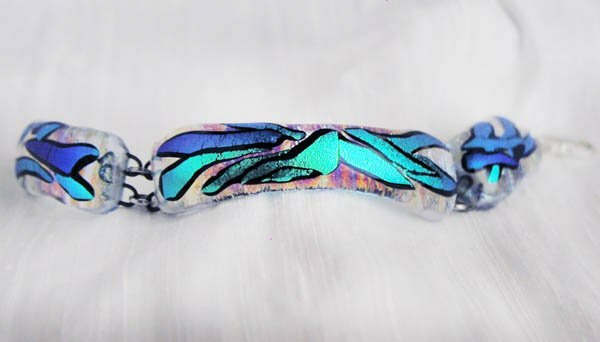 This iridescent translucent is made for the petite wrist. 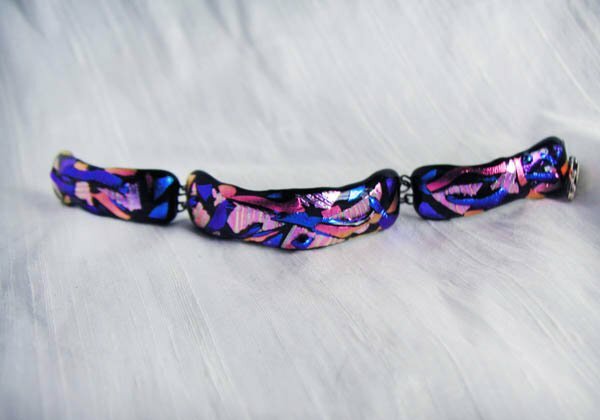 It is a mixture of dichroic glasses, so the colors are really alive, primarily magenta that changes to peach, and purples. 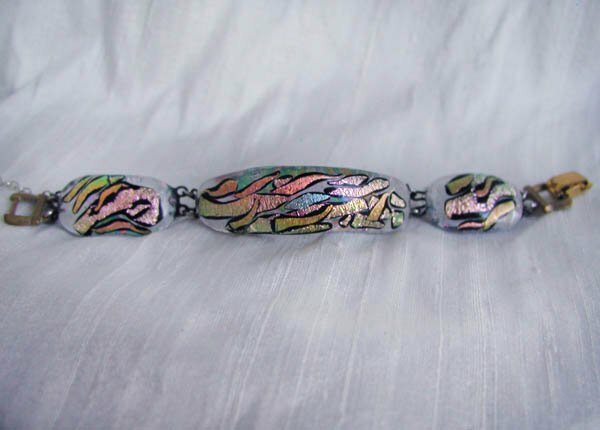 The bracelet is 6 1/8 inches long, and 5/8 inch wide, secured by a sterling silver lobster clasp.